delicious. – March 2010, Page 102. Chicken Larb Gai with mint and basil is a Thai-inspired dish that is perfect for those midweek dinners when you want something quick, easy and light. It doesn’t need oil, so the meat has a lovely light, un-fried quality to it. Served with rice, it’s a satisfying main meal. Heat the chicken stock in a wok or large frypan over medium-high heat, add the mince, fish sauce and ginger. Cook, breaking up the meat with a wooden spoon, for 5 minutes or until the meat has browned and cooked through. It might stick at first, but keep stirring! Add the chilli and sugar and cook, stirring, for 2 minutes, then transfer the mixture to a large bowl. Add the lime juice and most of the mint, basil and coriander to the warm mince mixture, then gently fold through, allowing the herbs to wilt. Taste and adjust the lime juice, fish sauce and salt to your liking. Arrange the cucumber and lettuce leaves on 4 serving plates. 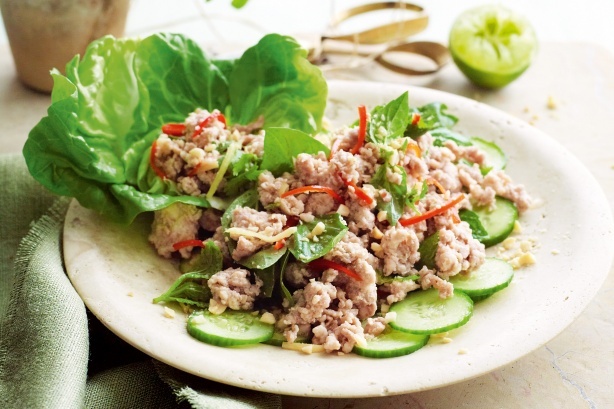 Use a slotted spoon to pile the larb gai over the top. Scatter with the peanuts and the remaining mint, basil and coriander, then serve with the lime wedges. Jessica, you’re always a step ahead of me. 🙂 I was looking at my Thai basil plants (they’re ginormous) and thought I should make larb out of them. Now, I must, after looking at yours! Mouth-watering! Haha yes you do! It is so tasty – you’ll have to give it a go Sam!